It was 11:42am CET on Friday morning when the Barça Anthem blared out from the PA system at Camp Nou. It wasn't, however, in anticipation of a match. Instead, 18 minutes before noon was the exact moment when Jasper Cillessen, FC Barcelona's fifth signing for the 2016/17 season, emerged onto the pitch of his new home, as thousands of fans launched into an enthusiastic cheer from the grandstand, where they had been patiently waiting. Holding a ball in his gloved hands, Cillessen made his way out to a goal which had been set up in the middle of the field. Click, click, click. A bevy of photographers trained their telephoto lenses on the blonde-haired Dutchman and snapped away in bursts. 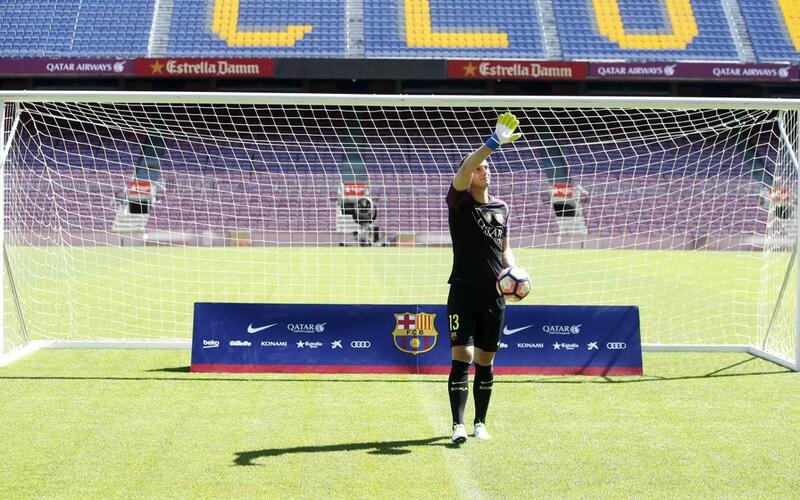 Cillessen did not juggle the ball, as other players do at these types of presentations. The goalkeeper, instead, posed in several positions, with the ball, at all times, securely in his hands. Ten minutes later, Cillessen headed back into the bowels of the Stadium. But the image of the new player patrolling the net was everlasting for the scores of fans in attendance. The morning was especially sweet for those persons with disabilities, who were fortunate enough to have Cillessen come to their sides for some photographs.